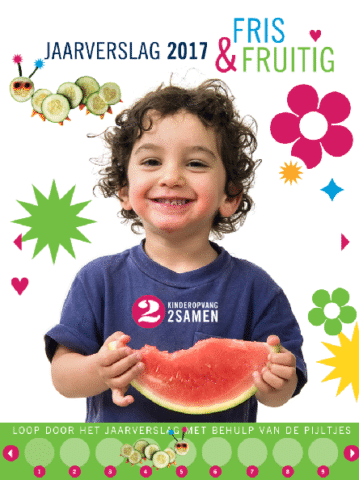 At 2Samen we're literally Fresh & Fruity, for example with our refreshed branding and new food policies. In 2017 we invested in the quality of our childcare with improvements in areas such as healthy nutrition, modern centres and renovated outside spaces. But also in well educated staff and for example our new Stints that allow us to go outside regularly to get some fresh air! Are you curious about our highlights? Have a look at our social annual report 2017 (in Dutch). You can also easily view it on your phone or tablet.